Kate was very happy when she saw her poem, which she made as part of library reading bear programme last year, was on display at Central Lending Library. The poem was on display since last month. May be it will be there for another few weeks. 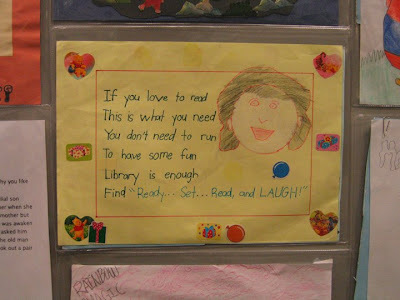 The "Ready, Set, Read ... and Laugh" book by Joanna Cole can be found at nearest library at children collection area. If Mum is not mistaken, Kate borrowed this book four times and read the whole book over and over again. She must be enjoying it so much.